How would you describe what “The Business” does? What is the key value that “The Business” delivers? Who do you believe are “The Business’s” primary competitors? Why do you think customers choose “The Business” ? Which of the following words (image attributes) would you associate with “The Business”? Innovative, Conservative, National, Regional, International, Friendly, Futuristic, Progressive, Dependable, Responsive, Formal, Trustworthy. They’re simple questions, however I can guarantee that the responses will provide you with incredible insight that you can use to make positive changes. Regardless of your industry, turnover or size, it pays to keep your finger on the pulse when it comes to managing perceptions. There’s no point in guessing when developing or refining marketing strategy. What do I want customers to think? What reasons do I want clients to recommend me? Perception management is about controlling each and every point of contact you, your team, and your product or service has with your market. As a decision maker you need to know the answers to these questions, otherwise your your market will end up determining the answers for you. The first step in fixing or adjusting market perceptions is to start with your own team, as these are the people that talk and interact with clients every day. Visual branding only goes so far. 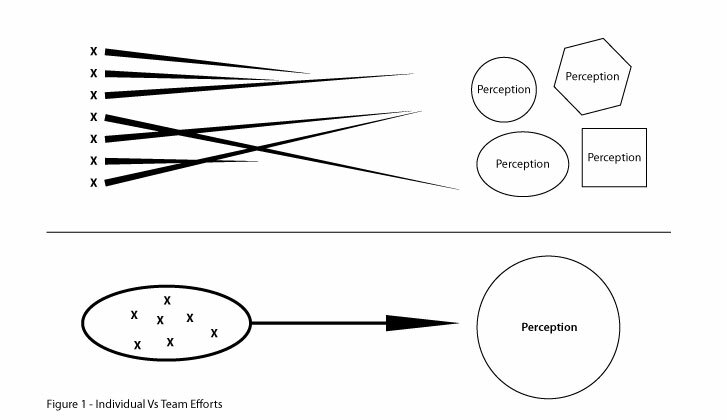 If the way your team behaves and interacts with clients contradicts your marketing and target positioning, you’ll end up with a fragmented understanding of your value (see Fig. 1) which in turn will lower overall perceived value and affect the bottom line. It takes time to build solid brands, so don’t expect people to just ‘get it’, lead by example. At the very least get your goals out of your head and onto paper so your team understands ‘why we’re here’.